Many readers may have heard of the endocannabinoid system but may still be unfamiliar with its function. 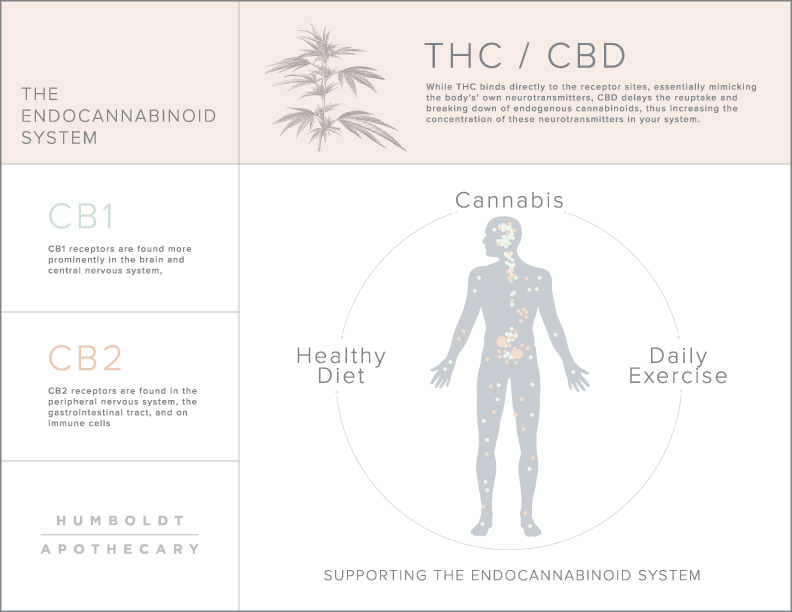 Due to the fact that it is such an important part of human health, Humboldt Apothecary is devoted to providing more information about the role that this system plays in our body and how we can best support the endocannabinoid system for optimal well-being. The endocannabinoid system is a biological system in the body that is involved in regulating a variety of physiological and cognitive processes. It promotes homeostasis and well-being, by keeping the many functions of the body in balance in a constantly changing external environment. It is involved in several physiological systems including neuroprotection, regulation of motor activity, the control of certain memory processing, as well as being responsible for modulating immune and inflammatory responses. Additionally, it influences the cardiovascular and respiratory systems by controlling heart rate, blood pressure, and bronchial functions, and is known to exert important anti-proliferative actions in tumor cells. Cannabinoid receptors are found throughout the body, giving them a variety of functions. CB1 receptors are found more prominently in the central nervous system, while CB2 receptors are more often found in the peripheral nervous system, the gastrointestinal tract, and on immune cells. The endocannabinoids that fit into these receptors are the chemical messengers that regulate almost every system in the body. While we make endocannabinoids, the suite of cannabinoids that are found in the Cannabis plant are considered exogenous cannabinoids (found outside the body, but having the same function as the cannabinoids that we make) and they fit into or have an influence upon the same receptors in our bodies. When this system of homeostasis is disrupted or deficient, it may contribute to a variety of conditions of disease. This may be the reason that Cannabis is so valuable as a therapy for such a diverse suite of symptoms and maladies. Recent studies show that underlying deficiencies of the endocannabinoid system play a role in fibromyalgia, irritable bowel syndrome, migraines, and a growing list of other medical conditions. Based on this understanding, many scientists are looking to modulate the endocannabinoid system through drug therapies that work to stimulate or inhibit the CB1 and CB2 receptors. While developing drug therapies will take years to test for efficacy and safety, using a whole plant Cannabis extract is a tried and true method of nourishing and supporting the endocannabinoid system. It can be thought of as a homeostatic regulator. The suite of cannabinoids in the whole plant extract have different means of interacting with the endocannabinoid system, which is part of the reason that this type of extract is so effective. While THC binds directly to the receptor sites, essentially mimicking the body’s’ own neurotransmitters, CBD delays the reuptake and breaking down of endogenous cannabinoids, thus increasing the concentration of these neurotransmitters in your system. The physiological benefits of these cannabinoids in the body are diverse, and include such protective qualities as broad anti-inflammatory effects, anti-proliferative action in tumor cells, regulation of appetite, digestion, and hunger, and neuroprotective effects against seizures and other central nervous system disorders. Cannabis has promising benefits for the central nervous system, and can be beneficial for anxiety, can improve mood, can aid in sleep disorders and PTSD. Additionally, it can diminish pain perception in a number of disorders, including multiple auto immune disorders and chronic migraines, to name just a few. While Cannabis is an important tool to support the endocannabinoid system, there are a few key lifestyle choices and habits that will help out considerably. Diet is particularly important. An ideal diet to promote overall health should include lots of fresh vegetables, high quality fats, and aromatic herbs and spices. There are a number of plants that contain terpenes similar to the ones found in Cannabis that will activate the CB2 receptor sites. In particular, leafy greens and spices such as cinnamon, black pepper, cloves, basil, and rosemary are high in the terpene Beta-caryophyllene. Eating foods that are rich in this terpene may help to reduce inflammation in the body. Consuming high quality omega-3 fatty acids has been shown to upregulate the CB1 receptors and have an anti-inflammatory effect throughout the body. Foods high in omega-3 fatty acids include walnuts, seeds such as hemp and flax, grass-fed meat, and oily fish such as salmon, mackerel, herring, and sardines. Aside from diet, exercise plays a crucial role in activating the endocannabinoid system. Exercise raises the levels of endocannabinoids in the bloodstream of people and animals. Studies have shown a significant upregulation of endocannabinoid concentrations in endurance athletes. Additionally, this system mediates vasodilation and bronchodilation in response to exercise. The increased cannabinoid levels in the blood stream produce a psychological state that closely parallels what many describe as experiencing a “runner’s high”. In conclusion, it is clear that the endocannabinoid system plays a vital role in our overall health and well-being. What is particularly noteworthy is that we have the ability to take care of this physiological system in so many simple ways. Taking small steps, such as creating a daily exercise routine and making healthy food choices are the most simple and important ways to take care of your body. Additionally, using Cannabis to supplement your daily routine will play a very beneficial role. Small amounts of Cannabis throughout the day will nourish your endocannabinoid system and help to promote balance in your body and radiant health. You can think of these basic steps as an insurance policy for better health, both mentally and physically.